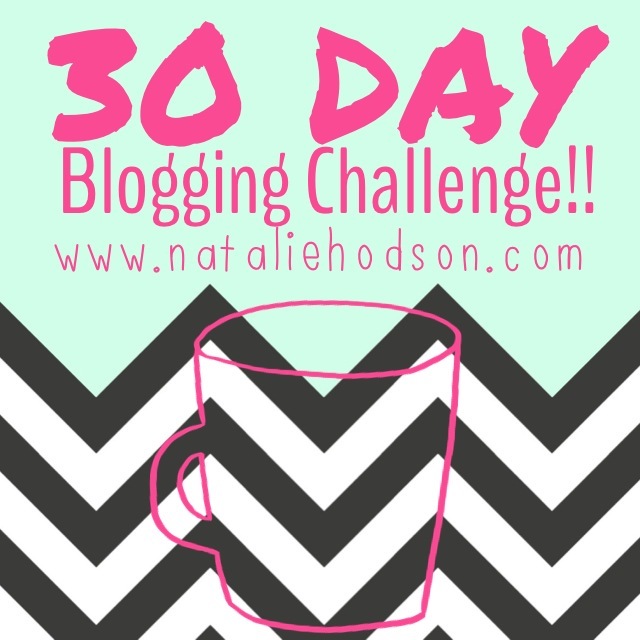 Today’s post is Day 11 of my 30 Day of Blogging challenge (click here to read about this crazy challenge I gave myself). This recipe was supposed to be posted yesterday, and I am so sorry it didn’t get finished in time! I spent the majority of the morning on the phone with my web hosting provider trying to figure out what on my website kept causing it to shut down! We had a number caching issues and a few plugin problems, and finally we were able to get it fixed. I’m sorry if you stopped by yesterday and the site was down, thank you for being patient with me! I was going to work on it later in the evening, and then I ended up falling asleep while I was trying to get the baby down (she’s breaking a top tooth and is extra fussy right now at night). So, to make up for it, I am going to do two blog posts today. 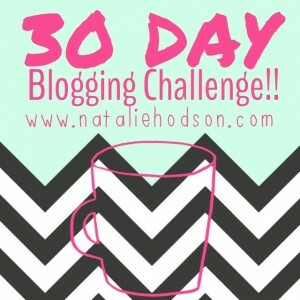 Check back later today for my next post! Here is a picture of my chubby little cutie pie. Can you believe she already has three teeth at five months!? I kind of wish we would have had a few more months before teeth popped up, but oh well, there isn’t anything you can do about it. I love the chubby phase she is in right now (well, really, she has been in since she was born weighing in at 10lbs). I love how when she smiles her eyes just kind of disappear because her cheeks are so big. 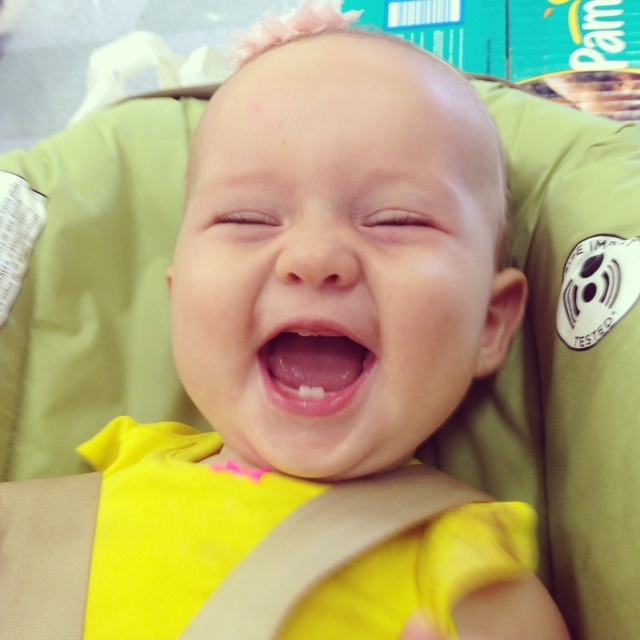 She is such a happy baby all the time. I feel so lucky that I get to be her mom. I was grocery shopping the other day and in the frozen fish/meat section I saw raw calamari. A lightbulb went off in my head and I thought, “hey I could make a healthier version of calamari at home!”. 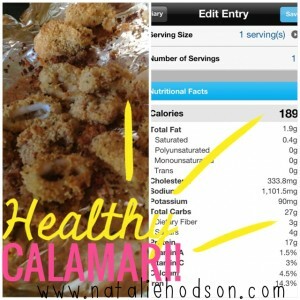 I love calamari so much. My husband and I rarely go out to restaurants just because of the phase of life we are in right now with the kiddos, plus we try to stay on a pretty tight budget, but when we do go out to eat one of my favorite things to order is calamari. However, most versions are deep fried and reallly unhealthy for you. I decided to buy the bag and give it a try. It turned out really good! Not quite as yummy as the restaurant deep-fried stuff, but was a pretty close second. I apologize in advance that the pictures I took are not very good pictures. It was so good and we gobbled it down so fast we forgot to take a pretty plated picture at the end. It is pretty dang easy to make too. The ingredient list looks long, but really it is just a small portion of a lot of the typical ‘italian’ seasonings. If you don’t have one of the seasonings, don’t sweat it, just leave it out. It should still taste good if you have to omit 1 or 2 of the seasonings. Step 1: Preheat oven to 400 degrees. Step 2: Line a large baking sheet with aluminum foil and spray with non-stick cooking spray. 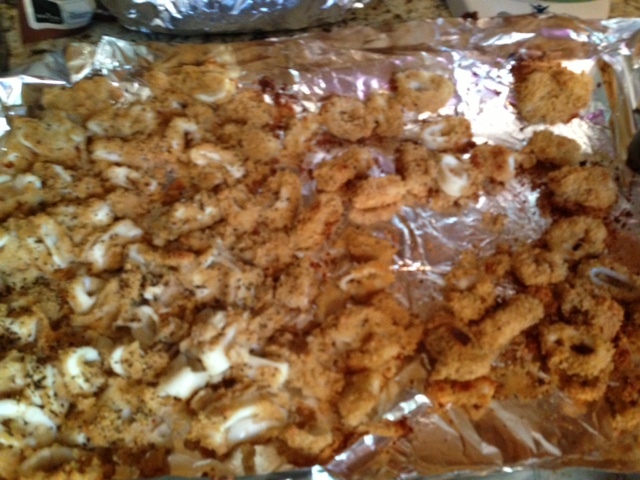 Make sure you don’t forget the spray or else the calamari will stick to the foil. 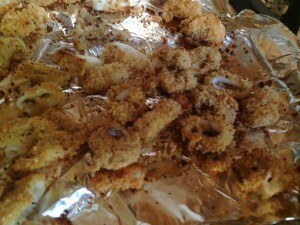 Step 3: In a shallow bowl mix together bread crumbs and seasonings. Step 4: In another bowl whisk together the egg and egg white. Step 5: One small handful at a time, place the calamari rings in the egg mixture until they are completely coated. 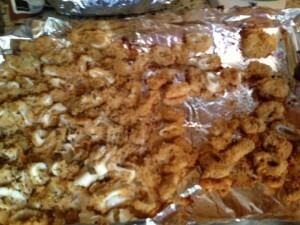 Then drop them individually in the bread crumb bowl until completely covered with bread crumbs. Be careful not to drop too much egg in the bread crumb bowl or else the bread crumb mix will get really wet and clumpy. Step 6: Spread evenly over the baking sheet. Step 7: Bake for 20-25 minutes until golden and crispy. I just drizzled mine with fresh lemon juice and ate them plane, but you could also warm up some marinara sauce and dip them in that too. Enjoy! Feel free to share this recipe and if you like it leave a comment and let me know how it turned out! Tasted good. Don’t forget the diced red onion for garnish. And tsatziki for dipping! I’m so glad you stated you used frozen squid. I live in southwest Florida but believe me it’s hard to find down here. Publix grocery does carry frozen pkgs.I use to get it frozen in 5 lb boxes and cleaned it. Before that it was fresh…about 29¢ a pound. ( many years ago).lol still can’t find the tenacles…:( I will be trying this recipe ŝoon. Sounds delicious !! Thanks so much. .your little one is beautiful. This wasa great recipe for date night with my boyfriend. (: We’ve both been trying to change our eating habits & yours was the first I could find that looked healthy for something to do with the frozen calamari I had! Absolutely delish. Thanks you so much for this, bookmarked, definitely saving this one!